Bahrain Economic Development Board (EDB) said it has signed three major agreements with the Chinese government in the areas of logistics, transportation, financial services, tourism and training during their visit to the city of Hangzhou. A senior delegation from Bahrain met Zhang Zexi, the vice chairman of Zhejiang Provincial Political Consultative Committee and a number of local government officials and business leaders at the Bahrain – Zhejiang Business Forum in Hangzhou, Zhejiang. The forum coincides with the signing of friendly cooperation between the Capital Governor Sheikh Hisham Bin Abdulrahman Al Khalifa and Chen Weiqiang, Vice Mayor of Hangzhou. 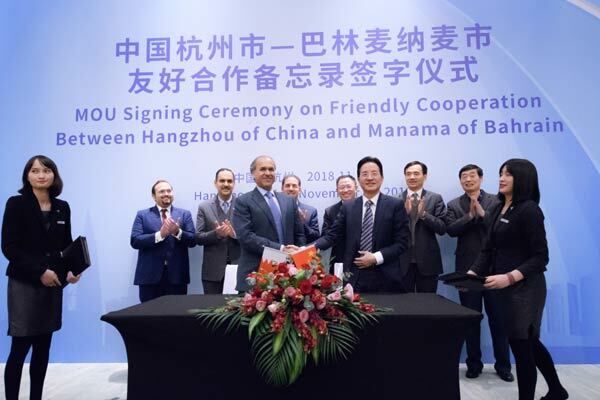 Hangzhou is Bahrain’s second friendly cooperation in China, and the new relationship represents a significant step towards stronger business ties between the two countries ahead of next year’s 30-year anniversary of diplomatic relations. “We are very excited to work with Zhejiang to create a supportive environment for cross-border business activities, enhancing information exchange and facilitating the growth of SMEs in both countries,” remarked Sheikh Hisham. “Both Bahrain and Zhejiang have highly digitised economies. We believe a partnership with the Zhejiang government and local leading businesses, such as Jolly Chic, will help both Bahrain and Zhejiang accelerate digital transformation in the 21st century economy,” he stated. “Hangzhou and Bahrain have had a long history of trade - since ancient Maritime Silk Road. Under the Belt and Road Initiative, we believe Hangzhou and Manama will have even greater opportunities for cooperation,” he added. Chen Weiqiang, the vice mayor, said: "Hangzhou is a leading city when it comes to China’s digital economy, and a number of leaders in the industry make it their home, including names such as Alibaba. We look forward to strengthening links with Bahrain in areas around business and culture." "Bahrain already has a history of partnering with China’s leading firms to grow and evolve their businesses and provide support in their “going-out” efforts," remarked Weiqiang. In 2009, Huawei moved its headquarters to Bahrain and is now creating and accelerating Bahrain’s 5G ecosystem, one of the most advanced mobile networks in the world. In 2016, Manama signed an MOU on friendly cooperation with Shenzhen, deepening the ties between the two countries. •Capital Governorate signed a pact on Friendly Cooperation with Hangzhou to enhance cooperation in the areas of logistics, transportation, financial services, tourism and training. Additionally, both cities will work to establish formal dialogues and regular visit exchange of high-tech companies. •EDB and the Department of Commerce of Zhejiang Province signed a deal to strengthen information exchange, establish a channel for regular investment information exchange and strengthen cooperation in economic and trade activities. •Another agreement was signed with Jolly Chic – Zhejiang’s leading e-commerce platform with a focus on the Mena region – to explore the possibility for the company to enlarge their BPO offering in the kingdom and use Bahrain as a hub for the Middle East. Bahrain Chamber of Commerce and Industry (BCCI) signed an MOU with the Zhejiang International Investment Promotion Centre to establish cooperation between Bahraini and Zhejiang companies and develop institutional capacity for the inception and growth of the private sector in both countries. Khalid Al Rumaihi, the chief executive of EDB, said: "We strongly believe that through these agreements, we can work together to create a shared future for Bahrain, China, and the Gulf region. Being the region’s freest economy, Bahrain can be the ideal hub for Chinese business, SMEs and startups to access the numerous opportunities available in the region." "We look forward to further enhancing economic ties with Zhejiang and welcoming Chinese companies to set up in the Kingdom," he added. As one of the most open and liberal countries in the Gulf region, Bahrain is known for its unrivaled market access, world-class regulatory environment, highly competitive taxation system, the lowest operating costs in the region, high quality of life, and a technologically literate population. As China sets out to build the Digital Silk Road to nurture the technology leaders of the future, Bahrain – the Gateway to Gulf – is perfectly positioned to be a partner of China, connecting Chinese companies to this high-spending region.